'The Latrobe City Council in Gippsland has a policy to cut down all non-native fruit trees on roadsides and poison the stumps. A number of apple trees and plum trees have already been destroyed in Yinnar South. Chris Dash, Council's Supervisor Arborist said that Council aims to create native indigenous vegetation corridors. However, there are no plans to revegetate the areas left bare by removing the trees, which leaves them open to infestation by noxious weeds such as blackberries. There is also no provision to be made for native birds such as king parrots which rely on the non-native fruit as an important food source, due to loss of original habitat. Latrobe City Council is the guardian of a valuable national gene pool, of which all Gippsland residents ought to be proud. Victoria is the pome and stone fruit basket of Australia for good reason - because it is one of the few states in this vast, arid continent where the climate is favourable. Gippsland in particular, with its wild roadside trees, is a treasure trove of diverse fruit DNA. Malus and prunus are the most common wild fruit trees. The malus and prunus fruit sold commercially these days is genetically very limited. Most apples, for example, were bred from a mere handful of ancestor trees. An ancient apple, Malus sieversii has recently been cultivated by the United States Agricultural Research Service, in hopes of finding genetic information of value in the breeding of the modern apple plant. Some of the resulting trees show unusual disease resistance. The variation in their response to disease on an individual basis is, itself, a sign of how much more genetically diverse they are than their domesticated descendants. Australia, too, needs to save the wild gene pools. If disease wipes out our modern fruit cultivars, those genes will be essential to the survival of future food crops. For several decades Australian fruit enthusiasts have been trawling the Gippsland wild stock, looking for chance seedlings with desirable characteristics such as flavour, colour and keeping qualities. This selection process is identical to the process that originally resulted in cultivars such as the famous Granny Smith apple. Gippsland resident and well-known horticulturist, Neil Barraclough is one who understands the full value of this genetic resource, and during harvest season he is always on the lookout for premium quality roadside apples and plums never before recognised. Without these wild roadside fruit trees we would have none of those excellent new Australian apple cultivars such as Warragul Surprise, Neerim Red and Traf Prince. 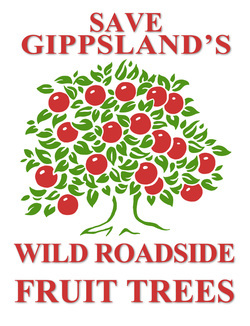 The same should be recognized of the valuable wild fruit trees of Gippsland. Wild fruit is part of Latrobe City community tradition. Local residents and travellers such as truck drivers all know the unofficial fruit routes across the region. They know where to pluck the best apples and plums in summer and autumn. People eat them fresh or make pies and cider; horse owners collect apples for their animals. This wild harvest has been going on for years and is an essential part of local culture. Furthermore, we live in an age of increased bushfire risk. Broad-leafed trees such as apple, plum and pear are actually listed by the CFA as fire retardant trees as opposed to natives. Eucalyptus and tea tree, for example, with their volatile oils (which according to law must be labelled ‘hazardous’ and ‘highly inflammable’ after extraction) are literally fire magnets. As a blaze approaches, the oils evaporate from the leaves and infuse the heated air. These oils actually ignite in mid-air and thus jump across roads and fire breaks. It is in eucalyptus's interest as a species to attract fire, because this promotes their germination and destroys competing vegetation. Malus and prunus, by contrast, are much harder to burn due to their high moisture content and lack of volatile oils. Trees like these have been demonstrated to slow the progress of fire across a landscape. Compared with noxious weeds such as gorse and blackberry, malus and prunus present a very low risk. They are found on roadsides and rarely if ever in bushland. This is because they require the rainwater run-off provided by sealed road surfaces. They are unlikely to survive in other Australian conditions. We hope the council will see fit to review this policy prior to any further destruction of non-native fruit trees along roadsides. Sign the petition now before it is too late.